MAINE MENDOZA’s open letter to her fans revealing that she and Alden Richards are just friend and members of a love team and that they never really became a couple in real life has spawned various speculations. 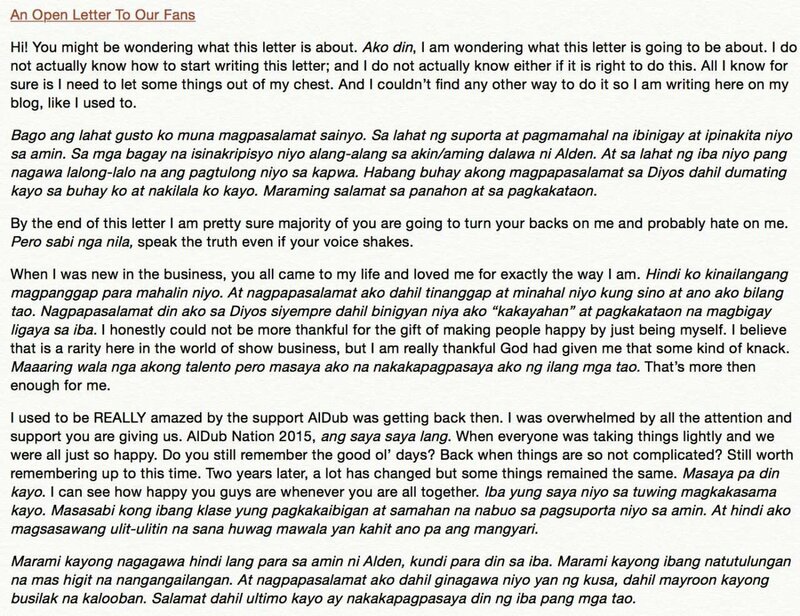 Because she went to the U.S. for a vacation, some said she was suspended by ‘Eat Bulaga’ for telling the truth in her letter. Others quickly concluded that she must be turning her back on showbiz since she said she wants to regain her freedom from the obsessive fans who want to control her and Alden. She can easily do this since she really comes from a well to do family (unlike other young stars who become breadwinners for their relatives) and she has already amassed millions from her endorsements alone during her more than two-year stay in showbiz. Another ridiculous speculation is that she will be moving to ABS-CBN, which cannot be true since she is managed by Mr. Tony Tuviera’s Triple A Management Co. and she’s still under contract with them. Then there’s someone who said that “Eat Bulaga” will disband their love team, which is another baseless conclusion even if it’s true that GMA-7 is preparing Alden to do a local version of the Korean hit, “Descendants of the Sun”, without Maine in it. Actually, what’s happening now is that the fans are missing seeing Alden Richards and Maine together quite intensely. Maine is completely quiet while abroad, not even making a single entry in her social media accounts. It’s only Alden who currently appears regularly in their long-running noontime show and joins JoWaPao in the “Juan for All” segment while Maine is hibernating somewhere. Well, as they say, absence makes the heart grow fonder, so we’re sure AlDub fans are missing them being together terribly even if Maine has admitted that what they were all doing then on screen is just for show. Maine might have been annoyed and hurt because their fans have become so meddlesome and quickly attack anyone being paired with her and Alden (life Sef Cadayona, Jake Ejercito and Reese Tuazon), but we don’t think she’d be that daft to turn her back on showbiz just because of their irritating fans. We’re sure she still knows which side of her bread is buttered and she has learned to love being on the limelight so it wouldn’t be easy for her to just pack her bags and leave showbiz for good. After resting for a while and giving herself a much needed break abroad, we’re sure she’ll make a comeback and it will be a grand one in “Eat Bulaga”. And upon her return, the AlDub supporters will embrace her and Alden wholeheartedly once again, even only a love team on screen, not off. But she and Alden should not really mind the fans so much, simply because they don’t really have that much clout to dictate on them. If they did, then their primetime soap, “Destined to be Yours”, would have been a big hit and would have had a longer run. As it is, they had to cut it short and the reason given was that they are shooting a new movie soon. But as we all know, that excuse proved to be sheer “boladas”. The year is almost over and Alden and Maine have not even started a new movie yet. The latest we heard is that they’ll shoot it when Maine returns from her vacation, so let’s just wait and see if this would be true or just another press release. Honestly, for their own benefit, we think Alden and Maine should start to be paired with other stars since they’ve just proven that they can go on their own with the high ratings of their solo appearances in “Dear Uge” and “Daig Kayo ng Lola Ko”. Just don’t mind the fans and to further annoy these pesky, feeling entitled know-it-alls, Alden should be paired with Reese once again, and Maine should be paired with Sef Cadayona or Jake Ejercito this time, in an episode of “Magpakailanman” or some other show.